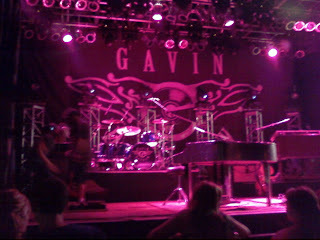 The stage before Gavin came out. A very small crowd. Q104’s winner and her closest 12 friends. There were also a couple of radio and television people there too. Gavin talking with Jen Tuohey on Q104. I don’t know what Rebecca is doing. 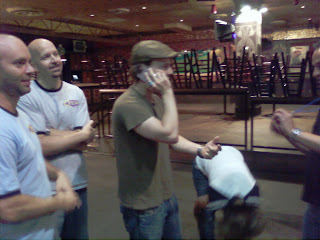 I was lucky to get the chance to go to the “meet & greet” with Gavin DeGraw Friday night at House of Blues. He was very personable. 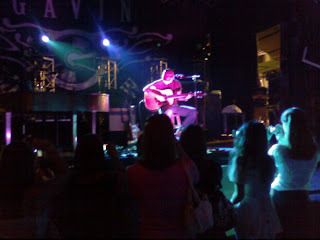 He played “Chariot“, “Cheated On Me” (which I really like), and a song he called “The Drinking Song“. After the songs, he came down and talked to us for a bit. He suggested we see the movie, “Sweet & Lowdown“. It’s a Woody Allen film and said if we ever got the chance to see this 80’s cover metal band in Las Vegas. I hate 80’s & 90’s big hair bands. 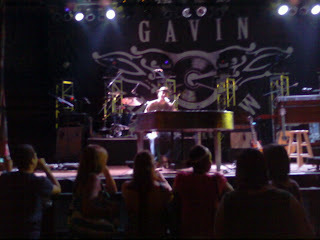 At any rate, I’m going to check out a lot more of Gavin’s music. Awesome stuff. Afterward, we headed over to Flannery’s to see my friend, Scott Smith, play a set. I was glad my friends liked Scott. He does such a great job! He’s playing again tonight at Flannery’s if you’re looking for something to do. Please check him out!! I didn’t get a shot of the PDP but we took advantage of the proximity of my building to the venue to listen to the concert. Actually, if you stand where the picture was taken, you can hear the music better than if you were at the end of the Viaduct. 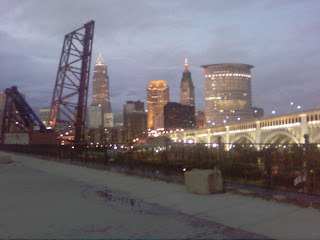 However, at the end of the Viaduct, you can actually see the concert. Shhh, don’t tell anyone. Now that the Viaduct is closed to cars for parking, it really has become somewhat of a park atmosphere. You can stroll down without having to worry about getting hit. Now, we have to get the people who walk their dogs to pick up their droppings. Now, I digress… You’d have thought Chicago would have opened the concert with a classic but we didn’t even recognize the first song. I thought maybe it was an opening act. It must have been from their new album. They rolled out all of their hits during the show and came back for an encore with “26 or 6 to 4”. Grilling, music and a beautiful night after the storms rolled away. I’m ready for Earth, Wind & Fire next at the PDP. This Friday at House of Blues, I’m going to see Gavin DeGraw and Marie Digby. My friend, Scott Smith, plays Flannery’s on Friday and Saturday night. Check him out if you’re in the neighborhood. If you haven’t been treated to Scott Smith when he’s been in town, you need to keep July 11th or 12th open and make a trip to Flannery’s. He’s coming back for two nights of live acoustic music. Check out his work here.